Home » Greenroom » Hand Dryers Vs Paper Towels: So Which Is The Best Hand Drying Option? Hand Dryers Vs Paper Towels: So Which Is The Best Hand Drying Option? Technology can sometimes dazzle us into believing it’s the superior option, but gadgetry is not always a guarantee of efficiency or quality. Sometimes, the original really is the best. When it comes to hand drying techniques promoted in workplace bathrooms, the evidence has consistently proven it. Research has shown that the old and reliable paper hand towels are not only more efficient at getting hands dry, but are also more hygienic. The more sophisticated methods, like warm air hand dryers to the jet air dryers, that have caught the imagination do not come up trumps in either of these categories. One of the most telling studies was carried out by the University of Westminster in London, England, in 2008. It revealed there are significant differences between the perceived technological advances in electric jet and warm air hand dryers and the old fashioned paper towels. In terms of actually cleaning hands, paper hand towels were far more effective, with the bacterial count falling by up to 91.5% on finger pads, and 85.2% on the palm of the hands. This was a hugely more impressive performance than the figures for warm air hand dryers, which seemed to nurture bacteria rather than kill them. On finger pads, the number of bacteria types increased by as much as 414%, and up to 478% on palms. Jet air dryers also saw increases, with 193.3% more bacteria on finger pads and 82.2% on palms. As a form of hand drying, meanwhile, the jet air dryers and paper hand towels both achieved about 90% dryness after 10 seconds (the average time people typically spend drying their hands). However, achieving the same degree of dryness with a warm air dryer took 40 seconds, making it the least efficient. The chasm in drying efficiency and bacteria removal comes down to hard graft. The rubbing motion on the skin physically removes more bacteria, while the paper hand towel absorbs moisture from the skin, thereby lifting the water-bound bacteria off. But hand dryers rely on powerful streams of air blowing the moisture and bacteria off the skin, a method of hand drying that could never be fully effective. What is more, ‘blowing’ moisture off the skin is not a hygienic option either. As any microbiologist will testify, air movement only disperses micro-organisms, so contamination is increased dramatically. And since drying with paper hand towels involves no air movement at all, there is no contamination, making it the most hygienic method of hand drying. The air streams produced by jet air hand dryers, for example, travel at 400 mph, blowing bacteria outward to a distance of 2 metres, landing on the body and clothing of other washroom users. Warm air hand dryers are not so guilty of spreading contamination since they far less powerful (thus the poor drying ability) and blow downward, so neighbouring users are not in the ‘line of fire’ so to speak. And what about the impact that the hand drying techniques make on the environment? This is one area in which the warm air hand dryer wins out, at least compared to paper. According to a study carried out by the US-based Environmental Resources Management consultancy firm found that paper towels spent about 64% more electricity over a period of 5 years than warm air hand dryers. Meanwhile, a World Dryer study of 102 hand dryers installed in public schools in Kansas, in the US, concluded that annual savings of 34.5 tons of solid waste, 690,000 gallons of water, and 587 trees were made, compared to using paper hand towels. Also, from a management point of view, the warm air hand dryer option is the superior. They are long-term hand drying investment, with machines typically used for 5 or 6 years, while paper hand towels must be restocked continuously, and disposed of regularly. Bins are an essential item in the workplace washroom to maintain hygiene levels, and regular waste removal is needed to prevent overflowing, ensure a cleaner working environment, and even help to cut the instances of illness amongst staff. Choosing the best hand drying technique for a public or staff washroom is important, with cost-efficiency always a key component in the decision-making process. 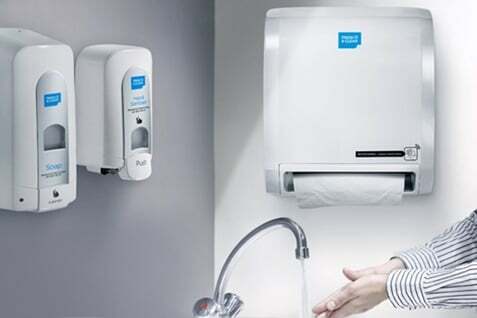 But clearly, in terms of hygiene effectiveness, paper hand towels remain the best choice, while in environment and maintenance terms, the warm air hand dryer wins out. In this battle of drying the hands, hand hygiene is the clear winner. So make your workplace is equipped with adequate facilities to ensure great hand hygiene amongst workers. Or you can simply leave it to Alsco to ensure that for. All you need to do is call Alsco for a free, no-obligation audit of your workplace. So why delay?